Note : This feature is available for the Technician version of R‑Studio only! When this mode is enabled, R‑Studio will generate a forensic data collection audit log that can be presented at court hearings. This log includes information about a hardware configuration on which the forensic data collection takes place and MD5 for recovered files. * Select Enable Forensic Mode on the Main tab of the Settings dialog box. Each time you start file recovery, the Forensic Log Settings dialog box will appear. Enter the required information and click the OK button to go to the Recovery dialog box. 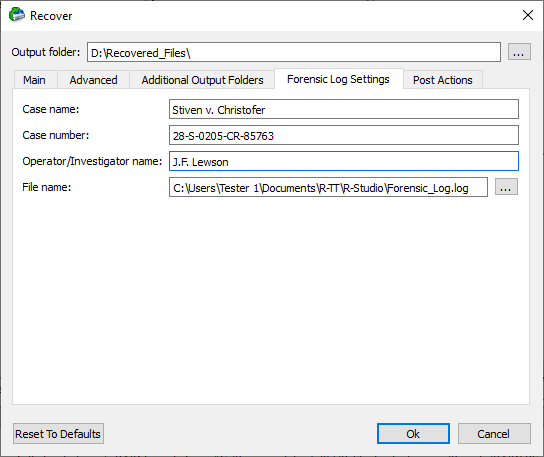 While file recovery, R‑Studio will create forensic data collection audit log in the specified folder. Below is an example of such log.